Thank you again for the generous support of your time and money to help make John Green Elementary such a wonderful learning environment for our children. 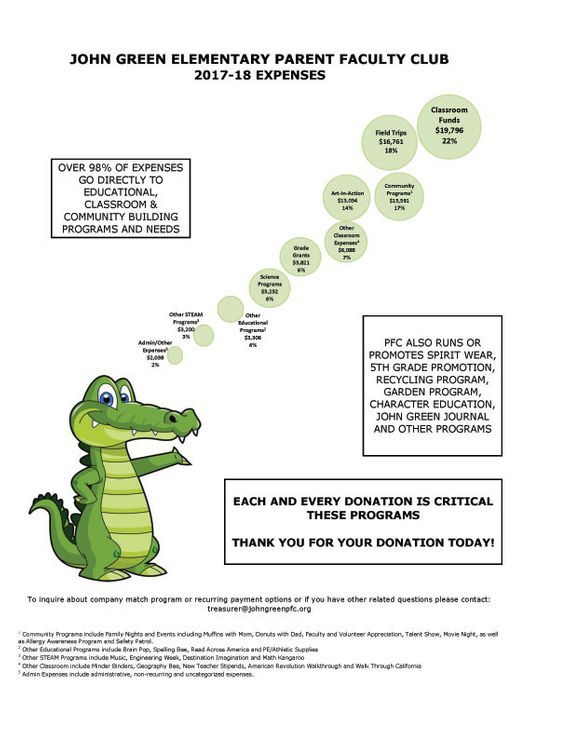 Classroom Materials, Science Programs, Field Trips, Grade-Level Grants like reading labs, core literature books, sight word supplies, classroom and teacher resources, and books for writer’s workshop, Character Education and Anti-Bullying Programs, Teacher Classroom Funds (stipend) for every teacher and so much more. We cannot provide these events and programs without your donations and volunteerism. As our student population grows these programs cost more and without your donation we are faced with the difficult decision of what programs will have to be cut. Last year the PFC spent over $60,000.00 for educational programs, classroom and teacher resources, Art in Action, and other core programs. If you haven't had an opportunity to make your donation we are suggesting $100.00 per student. This is only 56 cents per day of academic instruction.